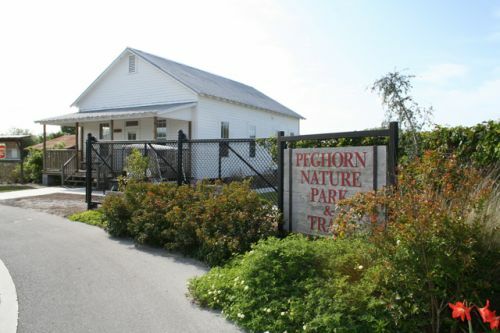 Peghorn Nature Park and Trails features a 58-acre park and trail system near downtown St. Cloud, including wetlands and wildlife habitat hosting migratory birds during the winter. This 58-acre facility is being developed by the St. Cloud Park & Recreation Department, with assistance from the Florida Department of Environmental Protection. The name "peghorn" is derived from the cattle that were raised within this area around the early 1900's. Characteristics of these cattle were horns shaped like wooden pegs. Today, much of the land surrounding Peghorn Nature Trails has been developed, leaving a small section of Florida's wetland - an area which is home to many native species of plants and animals. Future plans will link Peghorn Nature Trails with a trail system to be developed on the adjacent Steven Plantation property, once it has been acquired by the City of St. Cloud. City of St. Cloud Park & Recreation Dept.